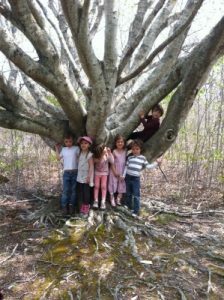 Pollywogs Nature Playschool, is a home-based childcare program, offering a play based and nature-inspired preschool program for children ages 3 – 5. My property is nestled in scrubland with native trees and shrubs; sassafras, scrub oak, pitch pine, bayberry wild rosa rugosa and wild clematis. I have added to it with viburnum, wisteria, clematis, weeping cherry, creating an organic space carved from nature. It is constantly changing with the seasons and is constantly providing us with interesting insects and bird life. My preschool program offers a curriculum that combines both traditional Kindergarten readiness learning with age-appropriate play-based activities. 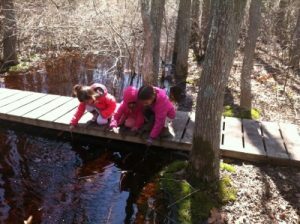 In addition, the natural world is a guiding theme in all areas of the curriculum. 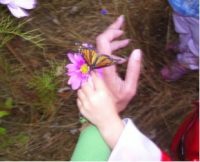 Children learn about nature through direct experience, exploration, and discovery of the world around them. Children spend as much of their day as possible outdoors where they are provided with an optimal environment for early childhood development. 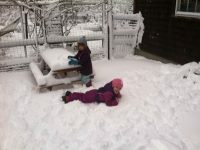 The outdoors offers an abundance of sensory experiences, more diverse gross and fine motor challenges, varied open-ended materials, and endless opportunities for imaginative play, all of which are crucial to all areas of development. 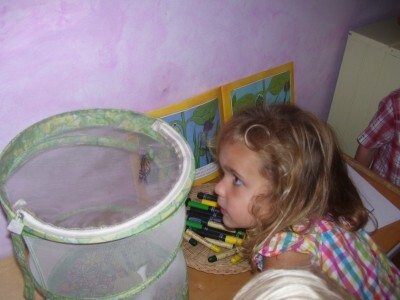 In addition, children will develop a sense of wonder and a deeper respect for our environment. One of the main advantages of being a small program, I am able to take children out on nature adventures daily. Our outings are not once a week “specials” such as Library Story Times or Music class, they are day to day occurrences. Our Island offers an amazing ecosystem with various habitats: heathlands, forests, ocean, ponds, bogs, marshes etc. they are visited regularly and explored with curiosity, reverence, and awe. In addition to our amazing Island being utilized as a living outdoor classroom, it was a natural transition to evolve into a Nature Explore Outdoor Classroom. I am thrilled to finally be certifying my outdoor space after working with this focus for the past six years. The Outdoor Classroom is another effective focus tool that has enabled me to present a natural environment in a classroom style which enhances safety and learning. 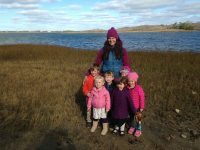 I am honored to be the first Certified Outdoor Classroom on Nantucket Island. I hope to inspire other early childhood programs and schools to begin the process. ● Jeff for bringing my visions into reality and creating a terrific sand castle and sand area, for the vision to use materials that add charm and character throughout the space. For providing your skills for ongoing upkeep and enhancements to the Outdoor Classroom. ● The Bresette, Roethke and Wilson families for the idea of a wish list from natureexplore.org and the special inscribed Nature Art table. It provides wonderful memories of your years in my program. ● All the wonderful families past and current who have entrusted me with their children’s education and for supporting learning through nature. ● Sally Ure for helping me put my ideas into words, for sharing and bouncing ideas and for our group field trips exploring nature. 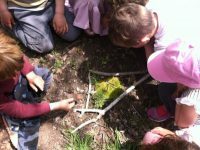 ● The Nature Explore program for creating this terrific educational tool and leading the way to get kids back into nature.